In 1884, George Eastman patented rolled photographic film and within a few years created the camera that could use that film. The first camera was sold in 1900 for $1, bringing family photographs to American homes for the next century. His firm, The Eastman Kodak Company, went on to create the film used on the Apollo 11 missions and eventually became a household name that controlled 90 percent of the market share for photographic film in the U.S.
Business mistakes are made one of two ways. The first is to accept a bad business proposition and invest in a losing venture. The second is to forego a good business idea and leave money on the table. Some are so afraid of the first error that they fall prey to the second. Be ready to answer questions about the hope that we have in Christ. Upon graduation, students are able to jump into the work force because they studied in school and left college prepared to face the challenges ahead. In our daily lives, we’ll encounter many opportunities to share hope with others, so we too need to be prepared. Be available to others rather than be buried in our own lives. Ministry needs often arrive at the most inconvenient times. Being available to others rather than filling every minute of the day with activity, even good activity, gives us the flexibility to share hope with others. Be watching for opportunities that God brings our way. Pastor Truman Herring in Florida taught me that sometimes the circumstances we face are not what they appear to be. What I might think is a broken down car is actually an opportunity to meet the mechanic who will fix my car. Or what I might think is an unreasonably long wait in the doctor’s office is actually an opportunity to connect with another person about to face a scary medical issue. 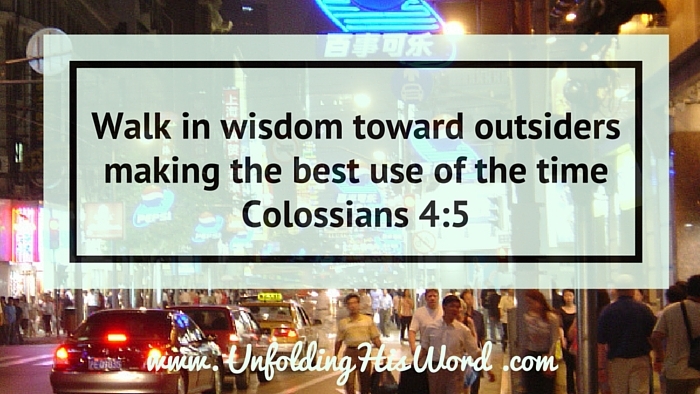 We’re to make the best use of the time, not so that we can check the most items off of our to-do lists, but rather so that we can walk in wisdom toward outsiders. And to do this, we must be ready, available, and watching for opportunities. When new technologies change the world, some companies are caught off-guard. Others see change coming and are able to adapt in time. And then there are companies like Kodak—which saw the future and simply couldn’t figure out what to do. Kodak’s Chapter 11 bankruptcy filing on January 19 culminates the company’s 30-year slide from innovation giant to aging behemoth crippled by its own legacy. Let’s not join the ranks of Kodak and forgo the opportunities around us. As we launch into the New Year, let us make the best use of our time with respect to others. This article first appeared on Unlocking the Bible January 8, 2016 and is posted here with permission.